With a translation that essentially means “heart’s delight”, dim sum cuisine is one traditional favourite of the Chinese culture. Originating from Guangdong, Canton, the history of dim sum can be traced back to the Silk Road trade route, where travellers would stop at tea houses along the way to rest on their journey. As tea was known to aid digestion, tea house owners began serving little warm snacks to accompany said tea. These bite-sized servings were meant to sate the traveller’s hunger just right, as those long journeys were not made for travelling on a full stomach coupled with exhaustion. 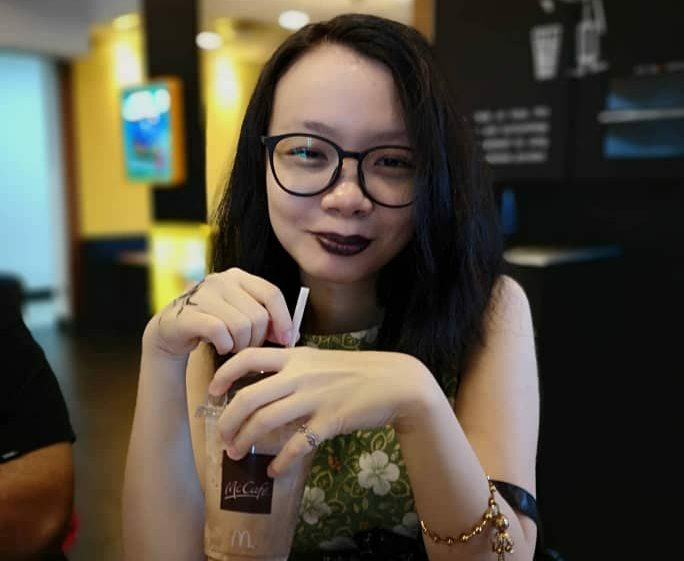 The little snacks consisted of seafood, meat, and vegetables to provide the nutrients of a well-rounded meal, as well as compliment the tea served, making dim sum synonymous with yum cha (to drink tea). They are often steamed, baked, or fried depending on the ingredients, and served in bamboo steamer baskets for easy portioning. 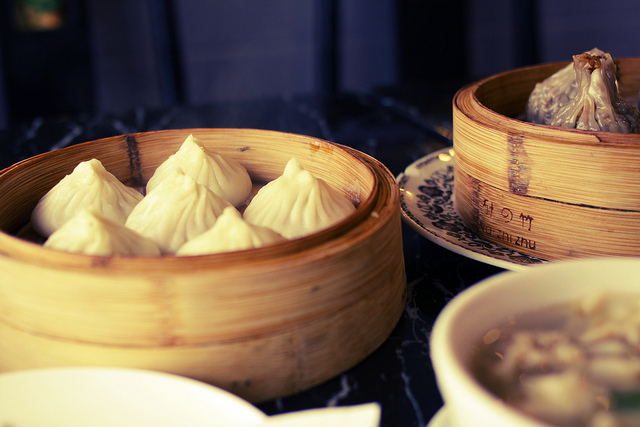 Often served in threes or fours in one basket, dim sum was regarded as a breakfast or brunch staple, as the small portions were ideal for light meals. 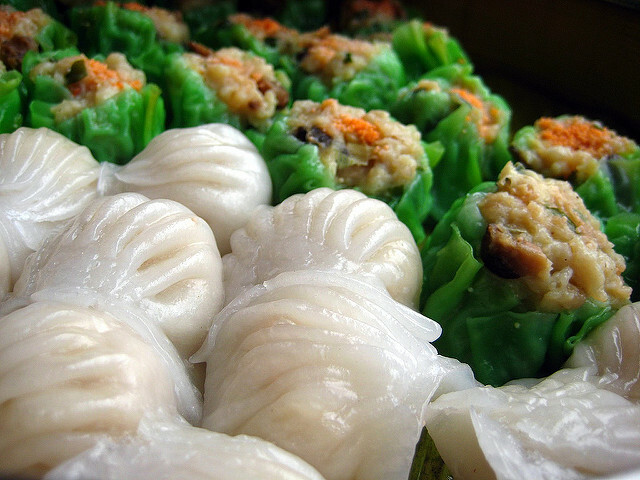 In today’s structure however, dim sum servings have been extended to dinners, catering to the people who live on fast, small meals like students and office workers. Most dim sum shops still uphold tradition, and you will witness the dim sum carted around in mobile steamer carts, and fried dim sum will be presented to each table on big trays for seated customers to pick and choose. Some more high-traffic and upmarket restaurants however, will require you to fill up a chit beforehand, and the dim sum will be made-to-order. While the dim sum can (and preferably) should be savoured on its own, the additional condiments of sweet chilli sauce and dark hoisin sauce is provided for those wanting a spicy-sweet flavour enhancer. The variety can reach up to 2,000 in entirety, and up to 150 in a single menu! Ever the crowd-pleaser, siew mai is a cup-shaped dumpling with pork or shrimp fillings, mixed with variants of bamboo shoot, black mushroom, or water chestnut. Another is the har gau—simple shrimp filling in a rice paper dumpling wrap. 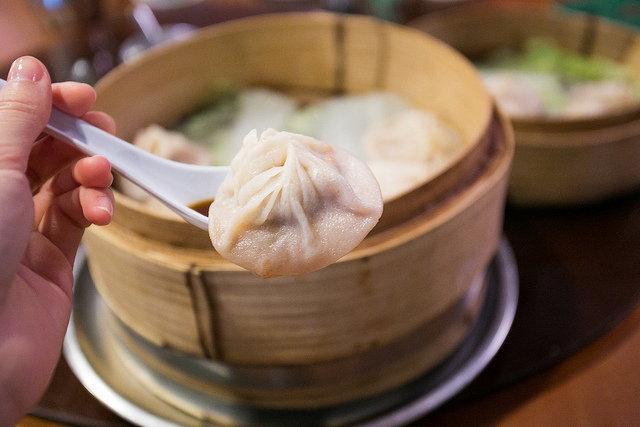 A newer, Shanghai-origin favourite is the xiaolong bao—the soup dumpling. This one is deemed fantastic for containing a spoonful of pork soup encased in a flour-based skin, and is eaten by nibbling the bottom of the dumpling to slurp up the broth before eating the rest of the meaty dumpling. 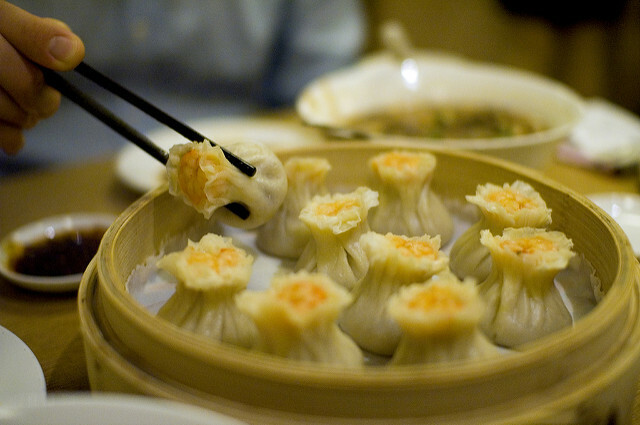 Many have been too eager, and end up burning their mouths by trying to eat the piping hot dumpling whole! The most popular dim sum to be served in almost every Chinese food shop, regardless of having a dim sum specialty menu, is the char siew bao—a fluffy white bun stuffed with sticky barbecued pork. For the more acquired tastes, the tau zi fung zao—declawed chickens’ feet deep fried and braised in sweet fermented bean sauce is presented in a little metal dish in the steamer basket. The more modern, extended menus tend to include other Chinese delicacies. One beloved item is chee cheong fan—rolled up rice noodles sliced and served with a light soy sauce gravy. These can be eaten plainly, or ordered to come stuffed with shrimp or meat filling. The chili served with this dish is special, as it is of the dry paste type, familiarly eaten with pan mee. To close the delightful breakfast, it is practically customary to get the tan tat—egg custard tarts with a flaky pastry exterior. 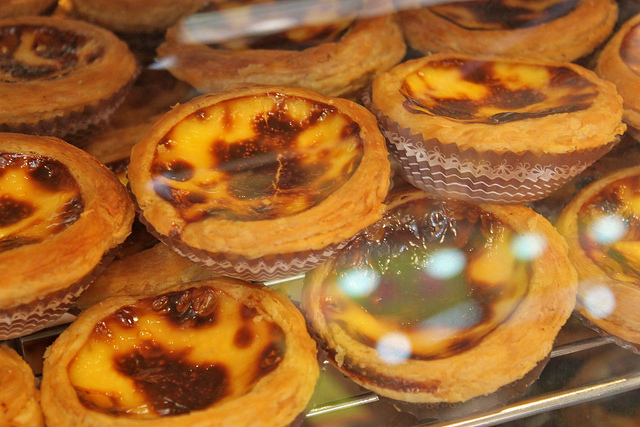 Originally from Macau, these sweet treats are often bought by the box for snacking on throughout the day. While these array of dishes certainly take centre space on the table, the pièce de résistance of the entire meal is the tea. 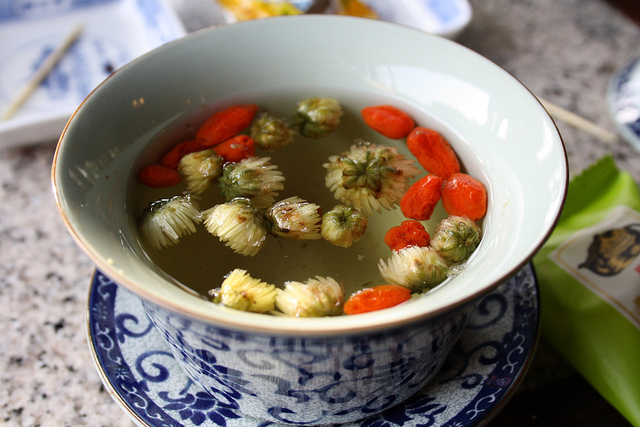 The usual blends are chrysanthemum, jasmine, or pu erh, all based on their calming tastes and benefit of easing digestion. With the drinking of tea and eating dim sum, there is a set of social rules rooted in the Chinese culture. Because this is a communal meal, great care must be practiced when pouring tea and using chopsticks. Keep your chopsticks to yourself. When offering others at the table dim sum, the convenient small sizes of the steamer baskets and plates ease in passing the food around. Pour tea for others before your own cup. Some customs might dictate the youngest at the table serving everyone else first out of respect, but the point is to make sure everyone at your table is included. Tap your index finger by your cup to thank the person pouring the tea. Tilt the teapot’s lid at an angle to indicate that more hot water is needed. The waiters and waitresses will notice and refill the pot as soon as they see it. Over order. Dim sum is meant to be eaten hot, and with the many varieties of meat and seafood, you would definitely get full faster than you think. Over ordering would render dishes waiting to be eaten just sitting on your table getting cold, and in cases like the xiaolong bao, the dumpling would stick to the wax lining of the steamer basket and risk tearing, letting the soup be lost to the table instead of your mouth. Malaysia has many shops specialising in these Cantonese breakfast foods, and one such restaurant is the Celestial Dynasty PJ. This banquet restaurant has recently launched a Super Value Sunday Buffet Lunch deal, offering over 50 dim sum delicacies as well as other Chinese dishes for a sumptuous weekend lunch. Adults can dine in at RM68++, while Senior Citizens (55 years old and up) and Children (5 – 12 years old) are at RM38++.